Subsequent damage estimates would be overwhelming—the numbers are unimaginable even as statistics alone surely elide the effects of the tragedy: 14 million affected, 4 million displaced, 1.1 million houses destroyed, over 3,200 schools damaged and so on. The poet-contributors would come not just from the Philippines but from the diaspora: the United States, Britain, the Netherlands, South Africa. The contributors would come to include an entire class of students at Skyline College in California. The contributors would come to number 133 authors—by any standard, an unusually large number of writers participating in a single book. All of the writers, I believe, acted from a desire, not just to witness but, to help. To write poems might require witnessing; to fundraise is to help. In this sense, VERSES TYPHOON YOLANDA is a rarity by melding the literary with the activism beyond talk-story, beyond just sharing information. By the time this article goes to press in OOV, I anticipate that profits from the books would have helped at least four groups aiding or representing Yolanda’s survivors: ShelterBox, Yellow Boat of Hope Foundation (who gives aid to fishermen), Panay-Bukidnon Tribes, and National Alliance For Filipino Concerns. Book donations also have been committed to various libraries, churches and hospitals in Tacloban where a book launch is planned on August 8; coordinated by poet-fictionist Almira Gilles, the event is expected to be held at University of the Philippines-Tacloban. The fundraising aspect of VERSES TYPHOON YOLANDA affected how I approached the project. From the moment I conceived of the anthology, I knew that I would not treat it as only a literary project, that is, I did not want to “judge” submitted poems based on literary merit alone. For that point-of-view would mean that I—on one level—diminished the intention of the poet-submitter to help those afflicted by the typhoon, something I did not wish to do. Thus, without telling anyone (until this essay for OOV), I decided that I would accept every poem submitted—specifically, I would accept one poem from each poet so that all poet-submitters would be represented. I made this decision even as the approach presented the risk that so many poets would submit that the volume of poems would be unwieldy. But this risk ended up not being an issue even though the amount of authors involved at 133 is a hefty number (the distinct majority of literary anthologies do not include writers that total more than a hundred). Candidly, I never worried much about this risk—the nature of poetry doesn’t usually translate into an overwhelming volume of interest such that the numbers would be unwieldy. Frankly, I would have welcomed this problem had it arisen as it would have been a nice problem: so many people writing poems! (I also had some ideas on how to address it if it was a problem to create a single book from everybody’s contributions). I did anticipate that the approach would require me to be proactive in making (gentle) suggestions for improving some of the submitted poems (though the majority of poems didn’t need any editing). In most anthologies and journals I’ve edited in the past, I usually looked at poems as they were sent to me and, except for the simple typo, rarely suggested changes (“improvements” for a poem is often subjective). 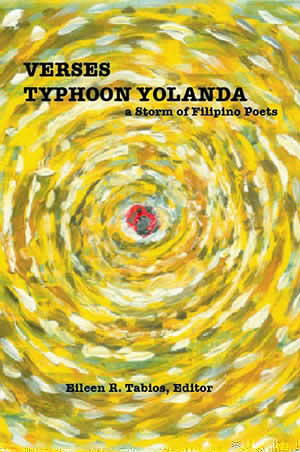 In any event, befitting my faith in the talent of Filipino poets, I feel all of the poems published in VERSES TYPHOON YOLANDA are valid. I also was not in a position to judge the literary merit of the poems submitted in Filipino languages: Filipino, Cebuano/Bisaya, Waray, and Hiligaynon. I depended on the authors’ English translations. But I did feel it important to represent Filipino in the anthology—I thought it a more respectful treatment. I also wanted a collaborative, community-oriented approach: in addition to relying on the Filipino language poets, I asked all participants for title suggestions. Indeed, I thank Luisa A. Igloria for being the one to suggest the final title for the anthology. Notwithstanding my openness to doing so, I didn’t end up publishing all submitted poems. But none were rejected. The poems that didn’t end up in the anthology were those whose authors did not provide English translations or who never replied to my follow-up emailed queries. “In these one hundred and thirty-three poems, we are invited to shed tears and see and feel more closely and deeply our Story as a people. There are connections to be made: the location of our islands on the typhoon belt, the impact of climate change on island nations, the arrogance of the global north and refusal to reckon with climate refugees, the history of supremacy and the colonizing gaze that engulfs all in its path, the numbing effects of consuming, and the internalized shame and oppression of folks on the receiving end of dominating narratives. In “Jazmin” (pronounced Haz-meen), I chose to allude to how poverty has intensified the socioeconomic consequences of Yolanda. “Jazmin / the girl / from Samar, who / is / deaf in / one ear…” grapples with loss and an uncertain future – she hails from a province where poverty incidence is at 55.4%, in a country that has been ranked by a UN agency as the third most vulnerable to climate change. In a nutshell, poverty has made her more susceptible to all disasters, man-made or otherwise, and all disasters effectively ensure that is kept in abject poverty. Breaking this cycle requires an adaptive social protection framework that supports and strengthens sustainable, climate change-resilient livelihoods. I love books. But VERSES TYPHOON YOLANDA (VTY) is a book I wish never had to exist. for the fury of the sea. the gaze of shocked survivors. at knowing the ending of your story. 2) use the book for (part of) a fundraiser for Yolanda survivors. In the case of the latter, I and Meritage Press are willing to sell the book at cost and have you keep the profits for use in your fundraising (for more information or any other facets of the book, contact me at MeritagePress@aol.com).